I think this should be the knitter's counterpoint to the carpenter's mantra of "measure twice, cut once." The reason the photos show an item with the bottom edge of loose stitches hanging free is that I didn't math twice-- not even once, really. 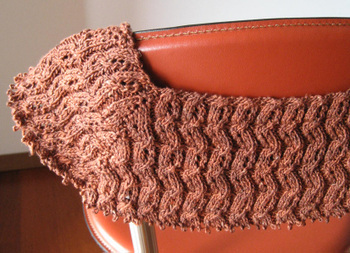 I followed the somewhat unspecific advice given by Barbara Walker in Knitting From the Top for a "classic raglan pullover," not stopping to think that I was planning to make a pullover with a wider and deeper neck than the one she describes as "classic." So I cast on stitches so the back neck width would be around 10 inches, and then increased at the raglan seams every other row. Once I reached the point where it was time to divide for front, back and sleeves, I realized that I was going to have a sleeve circumference of somewhere around 13 inches at the upper arm (about right for my purposes), and a bust circumference of around 41 inches (about 6 inches too many). Oops. Well, Barbara does mention that it may "be necessary to depart from the standard rate of increasing." Unfortunately for me, if I had decreased the frequency of raglan increases for all sections (back, front and sleeves), then the sleeves would have ended up being too tight, and if I had only decreased the frequency of increases for front and back, then the stitch pattern would not have mitered nicely at the raglan seam. 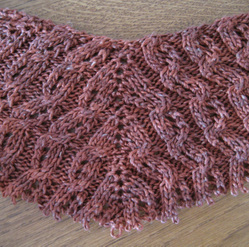 So it quickly became clear that I would have to frog and start over from the beginning, and the only way to keep the basic idea and use the same stitch pattern would be to make the back and front narrower at the neck, and the sleeve sections wider. If you’re like many knitters, during the height of summer you may find yourself impatient for the brisk days of fall and even winter, when you can pull out those woollen items created with long hours of pleasant labor. And yet-- human nature being what it is-- during those wintry periods, even knitters may find themselves remembering with longing those lazy hours on the beach in July or August: the penetrating heat of the sand, the glints of light off the water, the cooling salt spray flying off the crests of the waves. That’s why these gloves are a perfect anytime project: during the warmer months, they’ll augur frosty days to come, and once those days arrive, the wavy stitches, deep ocean teal and crystal bead droplets will remind you of those carefree seaside afternoons. Intermediate knitter/beginning beader; skills required include reading chart and working in the round. Alchemy Yarns Synchronicity (50% silk, 50% wool; 118 yds/108 m per 50 g skein); 30W: Spruce; 2 (2) skeins. See attached charts. 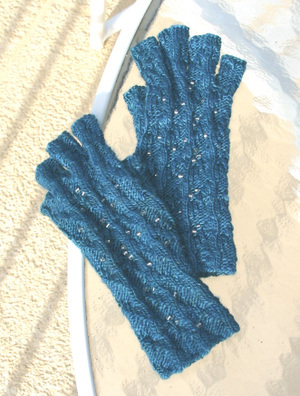 The original stitch pattern (“Seaweed” from Barbara Walker’s Second Treasury of Knitting Patterns) is used for the left glove only, while the pattern for the right glove is its mirror image. Both left and right gloves are fully charted to show the position of beads and construction of thumb gusset and fingers. Directions are the same for S-M and M-L; altering gauge by using different size needles results in two finished sizes. Follow written directions as well as charts! Picked up and knit on stitches for upper hand and fingers are not shown on charts, but are worked following chart for stitches adjacent to each part. Thread beads onto yarn before casting on, pushing beads down along yarn until they are needed. Beads actually sit between 2 purl stitches; to place bead, purl first stitch, push bead into place, and purl second stitch. 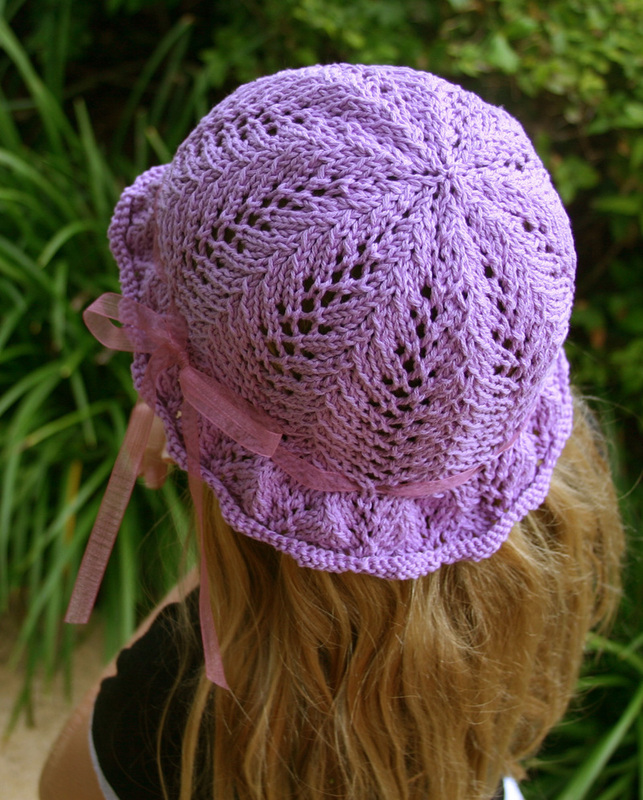 Click here to purchase pattern pdf ($3.50)! Includes written directions, photos and full charts for both hands. 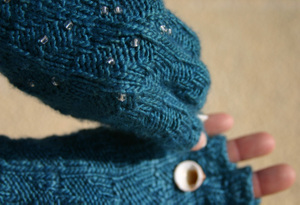 By the way, if your fingertips prefer to be covered, instead of binding off each glove finger, just continue the stitch pattern as established until each finger is slightly longer than your own, and then do not bind off: instead break the yarn, thread it through all stitches, pull to close, and then fasten on the inside of the finger. to get eye-catching photos! Last April, while we were in Florida, I recruited the husband to play photographer, donned bathing suit and gloves, grabbed my hapless toddler's hand, and posed like an idiot on the beach, all in hopes of increasing the chances that my pattern for "Seaside," now in Magknits, would be accepted for publication. I guess it worked?, although thankfully at the last minute I lost my nerve and didn't include the booty shot (shown here, albeit tastefully cropped) in my submission.